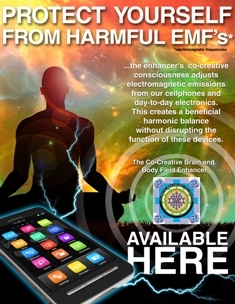 ...the enhancer's co-creative consciousness adjusts electromagnetic emissions from our cellphones and day-to-day electronics. This creates a beneficial harmonic balance without disrupting the function of these devices. Michael's primary focus is facilitating self-awakening and clearing properties and people from disruptive or disharmonious energies through co-creative processes. >> "A Centre for Harmony"
is definitely all that is!!! There is no stuff in the universe. It is all energy. Energy has consciousness. Quantum Physics is verifying this at every turn. Everything has a frequency, and resonance unique to itself, but part of the whole. We therefore recognize the "Conscious Intelligent Oneness" inherent throughout the universe and maintain that since it is conscious we can communicate with all of it. This spirit of cooperation implies that we must become co-creators and cease our attempts to impose our will on mother earth. Our site will attempt to promote this concept and we encourage those of like mind to submit links and articles echoing this premise. Truth is diverse. This is somewhat contradictory, but proves that all things hold true according to one's understanding at the moment. There is no need to debate over who is wrong or right. We are who we are at the moment until a new insight arises. Once we understand this we will no longer feel the need to prove it. We simply live it as it evolves. Michael does not have a cell phone, use facebook or join any groups. Please contact him by email or by calling the phone numbers listed on the site. To see more vides click here. Sign up now to the Able Crystals mailing list to receive emails announcing upcoming events, new products, special offerings and posts of pertinent information.